UNITED NATIONS, Jan 18 (IPS) - IPS Correspondent Tharanga Yakupitiyage interviews United Nations Environmental Programme (UNEP) Coordinator of Freshwater, Land, and Climate Branch TIM CHRISTOPHERSENFrom expansive evergreen forests to lush tropical forests, the Earth's forests are disappearing on a massive scale. While deforestation poses a significant problem to the environment and climate, trees also offer a solution. Deforestation and forest degradation account for approximately 17 percent of greenhouse gas emissions, more than the entire global transportation sector and second only to the energy sector. 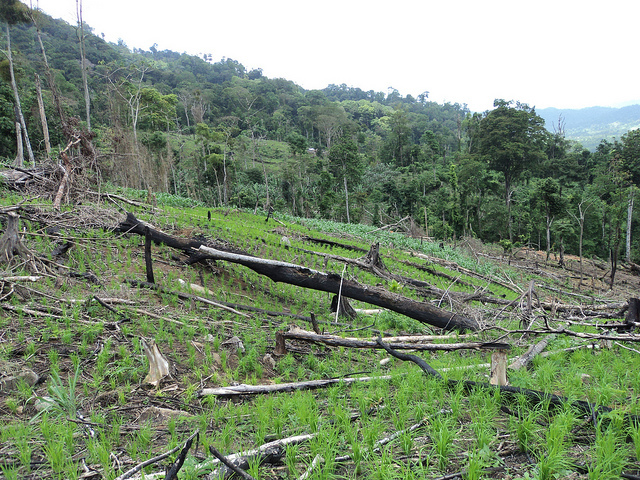 Tropical deforestation alone accounts for 8 percent of the world's annual carbon dioxide (CO2) emissions. If it were a country, it would be the world's third-biggest emitter, just behind China and the United States of America. In fact, according to the U.N. Convention to Combat Desertification (UNCCD), the land-use sector represents between 25 to 30 percent of total global emissions. If such forest loss continues at the current rate, it will be impossible to keep warming below two degrees Celsius as pledged in the Paris Agreement. While forests represent a quarter of all planned emissions reductions under Nationally Determined Contributions (NDCs) under the Paris Agreement, there is still a long way to go to fulfil these goals. The United Nations Programme on Reducing Emissions from Deforestation and Forest Degradation (UN-REDD) is among the international groups working to reverse deforestation. It supports countries' REDD+ processes, a mechanism established to promote conservation and sustainable management of forests. IPS spoke with UNEP's Coordinator of Freshwater, Land, and Climate Branch Tim Christophersen about the issues and solutions surrounding deforestation. Excerpts of the interview follow. Inter Press Service (IPS): What is the current state of deforestation globally? Tim Christophersen: The rate of deforestation has slowed since 2000 globally. At some point, it had even slowed by about 50 percent. We still have a lot of deforestation—it's just that the rate has gone down so that's partially good news. The good news side is we see a lot of restoration and reemergence of forests on deforested land. But often those forests of course cannot replace the biodiversity or ecosystem values that they once had. The bad news is that in some countries, deforestation has accelerated. This picture is mixed but it is not all gloom and doom. IPS: Where have you seen improvements and what cases are most concerning to you? TC: In general, the picture is quite positive in Europe where forest area is increasing by a million hectares per year. In Asia and the Pacific, the picture is quite mixed with China investing heavily in restoration and planting millions of hectares of new forests and other countries such as Myanmar where the pace of deforestation is accelerating. Recently, an area of concern is of course Brazil with changes in leadership there that will probably weaken protections of the Amazon rainforest. We expect they might not be able to keep their positive track record that they had especially in the years between 2007-2012 where deforestation of the Amazon dropped by 70 percent. IPS: What has UN-REDD and REDD+'s role in this issue? What are some successful case studies or stories that REDD had a direct role in? TC: REDD has, for example, put the issue of indigenous rights front and center to the entire debate about forests and land use. That is largely thanks to the strong role of indigenous communities in the climate discussions and the strong safeguards that were part of the REDD+ package. So these safeguards have triggered, also across other infrastructure projects, the knowledge and awareness of indigenous communities that they have rights, that they can determine national resource use within their jurisdictions—that was not so much the case before. For example in Panama, we have worked together with indigenous communities to map forest cover and priority areas for REDD+ investments. In Ecuador, indigenous communities have been involved from the start in the design of the REDD+ framework. There are other potential buyers that are out there and willing to invest in verified and clearly demonstrated reductions in deforestation. We have not seen the amount of funding flow into REDD+ that we had anticipated to date but it is picking up now. We also hope that more countries will come online with their emissions reductions that they properly verify with the UNFCC process. The issue is that land use and forests are about 30 percent of the climate problem and solution—it is a problem that can be turned into a solution. It is currently causing 25 percent of emissions and it could absorb as much as one-third of all the emission sequestration that we need. But it has only received about 3 percent of climate finance so there's a huge mismatch between the opportunity that natural solutions provide and the funding that goes into it. IPS: Over the last year including during the recent COP, many have brought up and discussed nature-based solutions. What are these, and what could such solutions look like on the ground? TC: Nature-based solutions are solutions to climate change or other challenges we face where we use the power of nature to restore or improve ecosystem services. An example would be using forests for flood prevention or purification of drinking water for cities. This is quite widespread in fact but it is not always recognised. About one-third of all major cities in developing countries receive their drinking water from forested watersheds. If we lose those forests, that would have detrimental impacts on a lot of people's drinking water supply. It can often be cheaper or at least more cost-effective for cities, provinces or nations to invest in keeping and restoring their forests rather than other solutions for water purification or drinking water supply. Another example that is often cited is the role of mangroves in storm protection in coastal areas. Again, this can be cheaper to invest in planting and conserving mangroves than building sea walls or other grey infrastructure projects that we have to increasingly invest in for climate adaptation. IPS: There are many initiatives around the world that involve planting trees as a way to address climate change and land degradation and many have received mixed reviews in terms of its usefulness. Is it enough just to plant trees? TC: Planting trees is never enough because trees are a bit like children—it's not enough to put the in the world, you also have to make sure they grow up properly. That's often overlooked that you cannot just plant trees and then leave them to their fate. Because often the reasons for landscape degradation, for example overgrazing, will very quickly eliminate any trees that you plant. So it's more about a longer-term, better natural resource management. Planting trees can be one activity in a longer process of restoring degraded forests and landscapes. There are other ecosystems that are also very important—peatlands, wetlands—but forests and trees will play a major role in the next decade. I am convinced there will be more and more investments into this area because if trees are planted and properly looked after, it is a huge opportunity for us to get back onto the 2 degree target in the Paris Agreement. IPS: Since the planet is still growing in terms of population size and food needs, is there a way to reconcile development and land restoration? And do wealthier countries or even corporations have a responsibility to help with land restoration? TC: Absolutely. I would even say land restoration on a significant scale is our only option to reconcile the need for increasing food production and meeting the other Sustainable Development Goals (SDGs) as well most notable goal 13 on climate action. Without restoration, we are probably not going to achieve the Paris Agreement. That part of nature-based solutions, massive investments in ecosystem restoration is absolutely essential and we see that more and more corporations are recognising that. The aviation industry is one of those potential buyers with their carbon reduction offset scheme which is called CORSIA. It certainly is an option to channel financing for forest protection but there are of course limits as to how much emissions we can realistically offset. Offsets are absolutely no replacement for very drastic, highly ambitious emission mitigation measures. We have to very drastically and quickly reduce industrial emissions. Offsets can maybe tip the balance in favour of offsetting only those emissions that can otherwise not be reduced or avoided but they are not a replacement for strong action on reducing greenhouse gas emissions from all industrial sectors including agriculture. The biggest part of corporate interest we see in restoration is from large agri commodity investors and food systems companies because they want to secure their supply chains and that's quite encouraging.